Welcome to Sundays at Home! For the vintage lovers amongst us, and I know there are many, I will be sharing all about Round Top on my blog this week. Today I want you to know that every Sunday at Bespoke Decor we offer vintage treasures. They go really fast, usually even before I wake up on the west coast! Our trips of vintage books are wildly popular. Pssst, this green group will be on sale tomorrow! So if you love vintage, like I love vintage, then sign up to get our emails so you never miss out on the delivered to your inbox Sunday morning treasure hunting from Bespoke. Sign up HERE. When you do you’ll also get for free our terrific 101 Best Decorating Tips & Tricks. Now let’s head into the party!! We’re happy you’ve joined us and look forward to seeing your home and garden, decor, DIY, and crafting ideas! 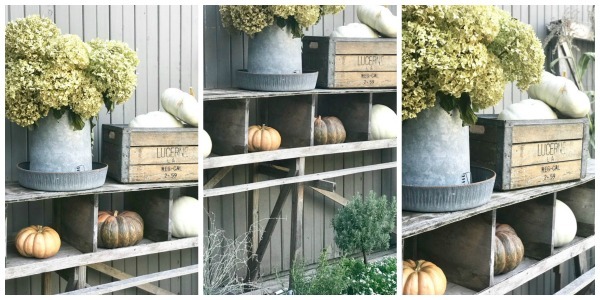 Fall Grocery Store Decor Ideas – Fall Porch Tips – What is 80/20 Style? Jennifer at The Magic Brush was inspired to create these candy corn pumpkins and they are so cute! Holly at Home with Holliday shared a lovely fall tablescape with brown and white pumpkins! Trish from Uncommon Designs shared a gorgeous fall tour!